Many humanities professors these days feel besieged. Departments are being eliminated on some campuses. The job market is terrible. Politicians and pundits regularly question the importance of the humanities, especially in comparison with science fields. On Monday night, the 2018 Jefferson Lecture featured an argument that the humanities are needed more than ever, and in particular in medicine. Being selected to give the Jefferson Lecture is considered the highest honor the federal government bestows in the humanities, and this year that honor went to Rita Charon, a pioneer in the field of narrative medicine. Charon, a Harvard University-trained physician with a Ph.D. in English literature, is the founding chair and professor of medical humanities and ethics and professor of medicine at the Columbia University Irving Medical Center. "I am here to suggest that there is much beyond the fixable that doctors must learn to see," Charon said, according to her prepared text. "Beyond the bleeding and the seizing, we need to see the complex lived experience of the person facing a health problem. If we don’t, we miss the very reasons that persons visit us -- their symptoms, their fears, their awareness of fragility. I am convinced -- with evidence to support my conviction -- that study and practice in the humanities is the most direct means to enable doctors to see the suffering that surrounds them." Charon argued that the skills of a doctor are in some ways similar to those of a humanities scholar. "We critique and analyze the work at the same time that we are summoned into its world and moved by its meanings. How similar this is to my medical work: I pay attention as an internist to signs and symptoms of disease, ruling in or out their possible causes and deciding what to do," she said. "At the same time, I open myself to behold the patient’s singular situation, to hear the story, to imagine the world being described. This is what allows patients to feel heard, to feel recognized, to enter whole into care." To illustrate the point about how the humanities allow doctors to "see the suffering" of patents and to understand them, Charon interspersed lessons from art. One of the paintings she discusses is "Sea and Rain: Variations in Violet and Green," a small 1865 painting at right by James Abbott McNeill Whistler. "The palette and the scale seem at odds with one another -- one soft, the other grand. Notice what reaches you, what you find yourself wondering about," Charon said. "Does it have plot and characters? What is the mood of the painting, and what mood do you find surfacing in you as you look at it?" Her answer: "I imagine that some of the words that come to mind are vastness, solitude, loneliness, maybe independence, autonomy, or mastery. I hope some of you noticed that the human figure is translucent -- it is a quite striking detail in the original. You can see through the figure, especially the legs. As I stood in front of this painting, I had two conflicting senses: all this sea and sky and strand is here for this one guy -- the profusion, the bounty, the surfeit, the delicacy of the planet. On the other hand, the human figure is just an afterthought, barely there, expendable, maybe in the process of being erased." Charon was so taken with the painting that she hired a painter to copy it, and the reproduction now hangs in her home. Her interpretations of the painting change from day to day, she said. The body in the painting is important, Charon said, and illustrates her view of why narrative medicine is so vital, and why medicine needs the humanities. 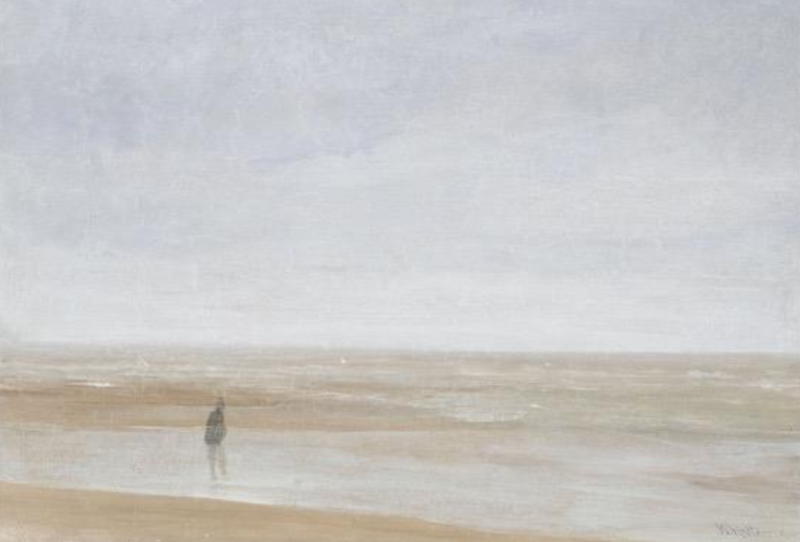 "Whistler gives us a body to contemplate. Medicine treats bodies, and bodies are not things," she said. "Well, they are things and they are also more than things. In committing a Jefferson Lecture to medicine and the humanities, the endowment is making a powerful statement about the centrality to the culture, not just to medicine or science, of the problem and the gift of the body. We in the humanities are, in a subversive way, reappropriating the body from the sciences. Not only is the human body a piece of biological equipment, fixable when it breaks down, and to be discarded when it reaches the end of its functional lifespan. It is the singular expression of the time/space coordinates of one being, whose very identity exhales with each breath."